The research by the File on 4 programme in conjunction with the Sunday Post newspaper focused on Smyllum Park Orphanage in Lanark. 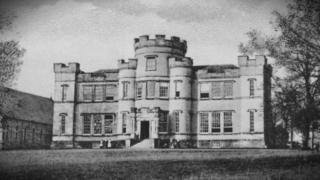 It opened in 1864 and provided care for orphans or children from broken homes. It closed in 1981, having looked after 11,600 children. A burial plot, containing the bodies of a number of children, was uncovered by two former residents of Smyllum in 2003. Frank Docherty and Jim Kane discovered an overgrown, unmarked section of St Mary's Cemetery during their efforts to reveal physical abuse which they said many former residents had suffered. In 2004, the campaigners said the Daughters of Charity told them their records suggested that children had been buried in 158 compartments in the graveyard. Frank and Jim, who both died earlier this year, believed however, that the numbers were far higher as the nuns had indicated their records were incomplete. The investigation by File on 4 and the Sunday Post indicates they were right; at least 400 children are understood to be buried in the plot. "Oh my God, I've got goose pimples. It's shocking," said Frank Docherty's widow, Janet. "He had been trying for years to find a figure and he didn't get anywhere. That's unbelievable." The death records indicate that most of the children died of natural causes, from diseases common at the time such as TB, pneumonia and pleurisy. Analysis of the records show that a third of those who died were aged five or under. Very few of those who died, 24 in total, were aged over 15, and most of the deaths occurred between 1870 and 1930. One of those believed to be buried there is Francis McColl. He died in 1961, aged 13; his death certificate indicates he died from a brain haemorrhage. His brother Eddie spent decades wondering what had happened to Francis. At one point, he heard he'd been struck on the head by a golf club, which now chimes with the evidence of the death certificate. But Eddie could find no trace of where his brother had been buried. "It's ridiculous," he says. "I'm not happy about that. Whoever is behind this, I hope they can live with themselves." Many allegations of abuse at the care home were also uncovered by File on 4 and the Sunday Post, including beatings, punches, public humiliations and psychological abuse. This case mirrors the investigation into the Tuam mother and baby home, an Irish institution run by a religious order, where it is thought nearly 800 babies and young children died and were buried in unmarked graves between the 1920s and 1960s. What happened at Smyllum is one of the topics that the Scottish Child Abuse Inquiry is examining. Two representatives of the Daughters of Charity gave evidence to the inquiry this summer in which they said they could find no records of any abuse taking place. The nuns refused to respond to detailed questions from reporters about how many people were buried in the mass grave. In a statement, they said they were "co-operating fully" with the Child Abuse Inquiry and that they believed that was the "best and most appropriate forum for such investigations". They continued: "...as Daughters of Charity our values are totally against any form of abuse and thus, we offer our most sincere and heartfelt apology to anyone who suffered any form of abuse whilst in our care". Since 1855, there has been a legal duty in Scotland to register a death. Those death records are available for scrutiny at the National Records for Scotland office in Edinburgh. The records contain details such as the name and age of the deceased as well as what they died of and their usual place of residence. After focusing on those people under 18 who'd been resident at Smyllum, the BBC and Sunday Post checked local burial records for Lanark, which today are held with South Lanarkshire Council. They found no evidence that the dead had been buried. Some children were sent to the home from other places across central Scotland, so spot checks were also made with a number of other areas. Burial records were discovered in Glasgow for two of the dead. No other area we approached could find any burial record for the names we asked them to check. As the Daughters of Charity have previously indicated that children were buried in an unmarked plot at the cemetery, and that their records are incomplete, all the bodies are believed to be buried in the graveyard. The method is a replica of that used to expose a mass grave in the Irish Republic. File on 4: The Secrets of Smyllum Park is broadcast on BBC Radio 4 on Tuesday 12 September 2017 at 20:00 BST. You can also catch up on the BBC iPlayer. Have you got something you want File on 4 investigating? Email us - fileon4@bbc.co.uk or follow us on Twitter.